nakedspecs.com, a new brand of online eyewear, plans to bring clear vision to more than 10 million people through a unique community-giving program. With a range of designer prescription glasses and polarized sunglasses from $90 a pair with free worldwide shipping and a no fuss returns policy, Naked Specs is the only eyewear company in the world to have a ‘buy 1, give 5’ social-giving model. 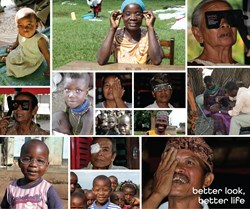 Naked Specs - changing the way the world sees through their 'better look, better life' community giving. "We take glasses and eye care for granted, but for 285 million people, it's not that simple. I've decided to do something about it and hope that people fortunate enough to be able to read this will join me." - Carol Pearce, CEO Naked Specs. The online store at nakedspecs.com is easy to browse, with frames grouped into collections and features virtual try-on software. The team at Naked Specs will even call optometrists direct for customer’s prescriptions! All glasses are manufactured to order with high index extra-thin lenses, and scratch resistant lens coatings are included in their low prices. Customers can save hundreds of dollars buying great glasses with the added bonus of giving to those less fortunate, choosing from a range of eye-care initiatives to personally support in less developed countries when they checkout. nakedspecs.com launched on 23 December 2013. Privately owned by Carol Pearce who is based in Perth, Western Australia, the company distributes glasses worldwide, with most orders delivered within a week. Pearce is a well-known entrepreneur in Western Australia with a talent for her involvement in start-ups. She is passionate about ‘changing the way the world sees’ and bringing high quality glasses to the world at affordable prices. Pearce is currently available for interviews and loves to talk about ‘business for good’. High resolution images are available for immediate download from [https://www.dropbox.com/sh/9e6jxyvybt6dv0u/768ID8kbB4 __title__ Dropbox Link for Naked Specs high res images]. Low resolution images are available for immediate download from [https://www.dropbox.com/sh/cllur5j03vqiyph/pq_QiG0KAX __title__ Dropbox Link for Naked Specs low res images].